My guy and I drove to the central Maine town of Madison this morning to join Master Naturalist Kate Drummond on a walk that combined the natural and historical context of a trail beside the Kennebec River. 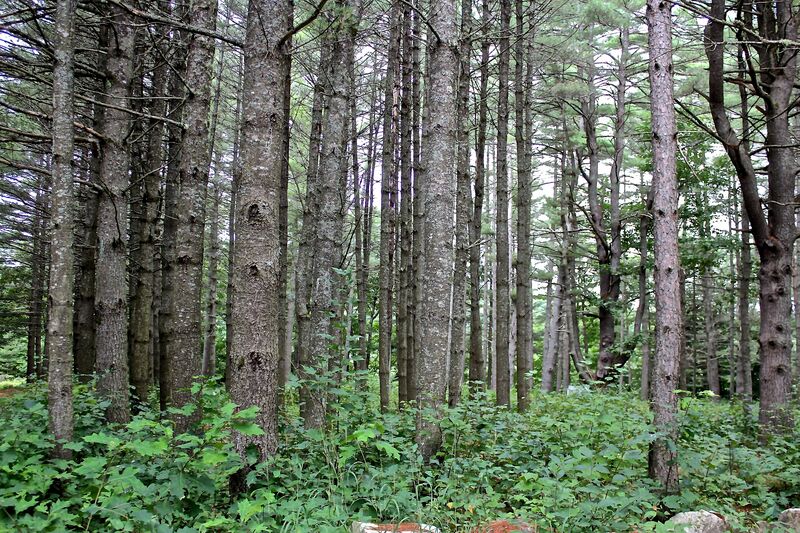 The Pines, as this area is aptly named, once served as an Abenaki settlement. Kate began by sharing the history of Father Sebastien Rasle, who lived among the Abenakis, learned their language and converted them to Catholicism. For more than thirty years in the late 17th/early 18th century, he served as a Jesuit missionary and built at church here. 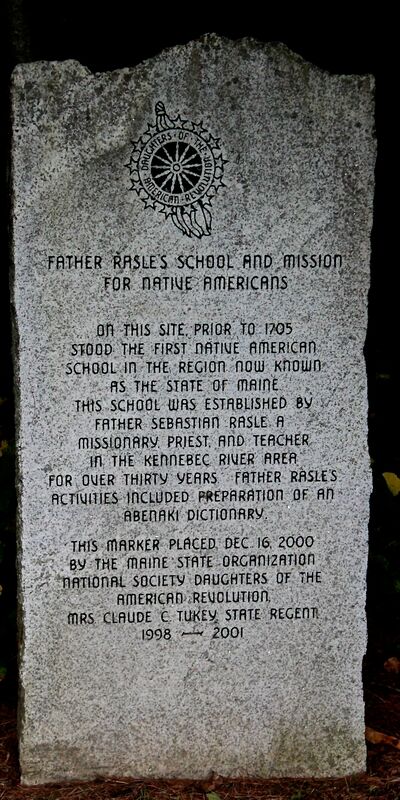 Father Rasle educated the children and developed a dictionary of the native language. 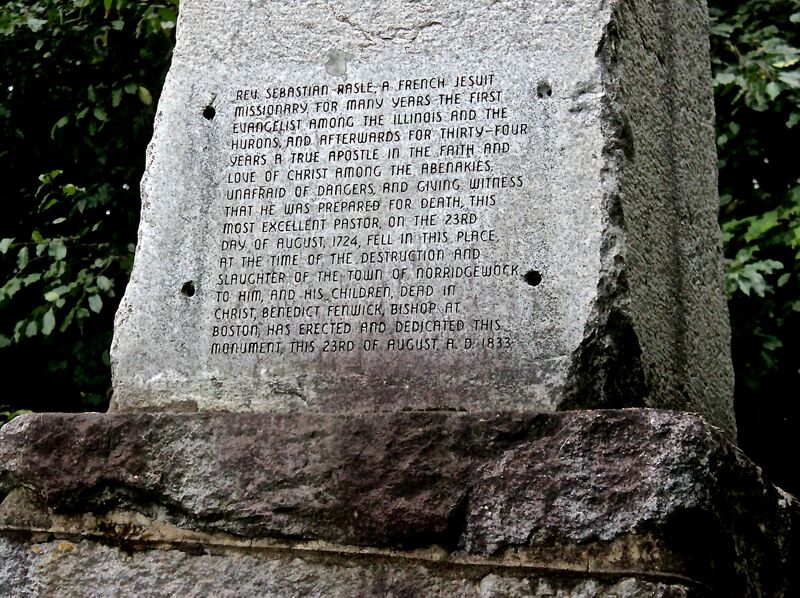 He also helped keep the English at bay when they tried to encroach upon Indian lands–until that fatal day–August 23, 1724. While Father Rasle had earned the respect of the Abenakis, the English militia was wary of him. They combined forces with the Mohawk Indians to destroy the village and killed at least 80 Abenakis and Father Rasle 300 years ago today. And so it was that Kate chose to honor Father Rasle and the Indians he lived amongst by sharing the trail with local townspeople (and us–from two hours away) to tell his story and recognize the natural elements that were a part of their daily life. Kate is a high school chemistry teacher, so captivating her audience is a part of her makeup. To begin, she asked us to stand still for a minute and listen, look, be in the moment. After we shared our observations, she took us back in time, to imagine what the area looked like three hundred years ago. And then our real work began. 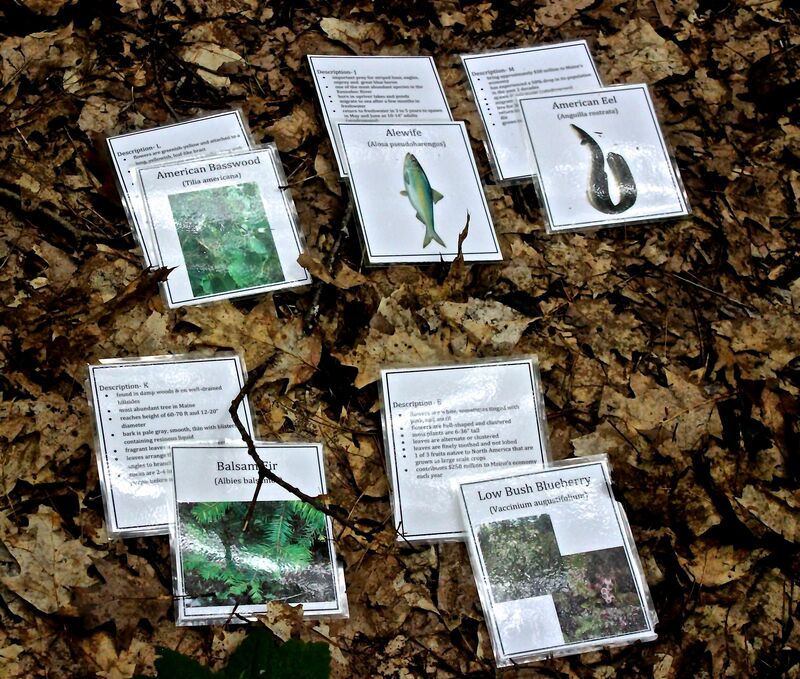 We were given a set of cards and had to match the photos to the card listing cool facts about a particular species. Thankfully, there was no quiz at the end, but I suspect this group would have passed with flying colors–everyone was equally engaged. Our first was a mystery. 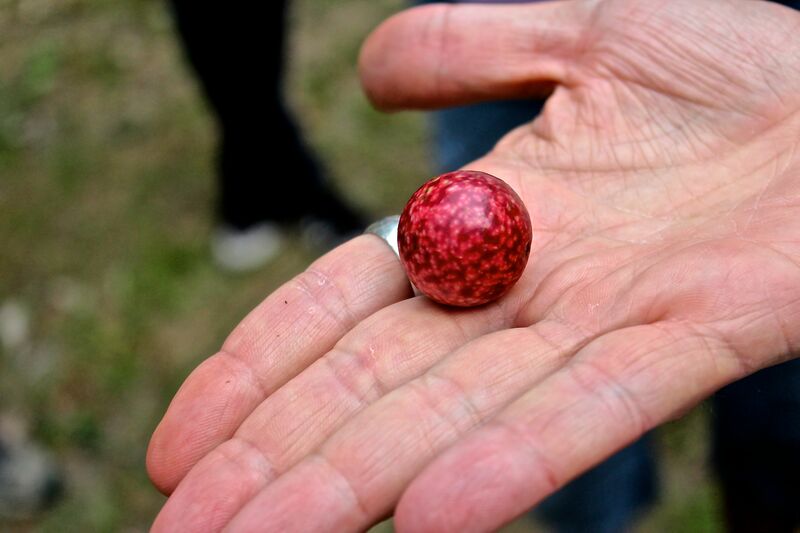 This speckled red ball, about the size of a jawbreaker, had us puzzled. 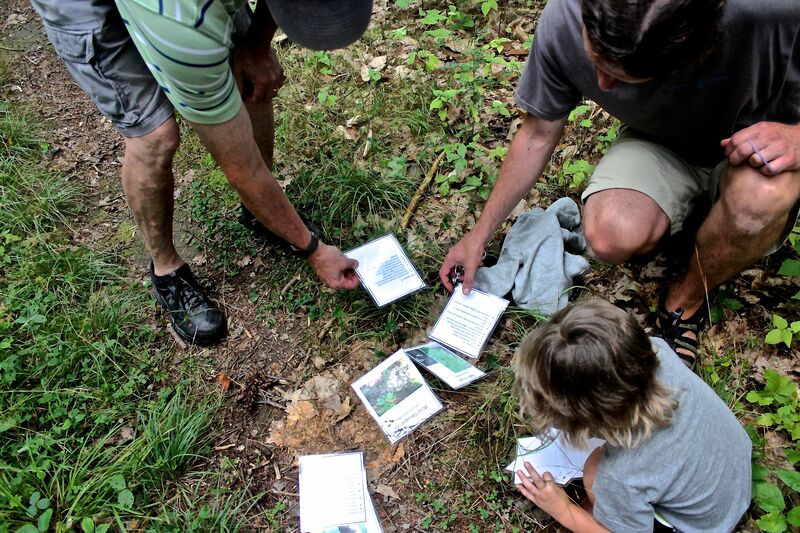 We found several on the ground beneath Northern red oaks and Eastern white pines. Cutting one open, it looked rather fleshy and we could see what appeared to be an insect, but we still weren’t sure. And when we later found an empty acorn apple gall, we realized it was the same size. Well, a quick Google search for “large speckled red ball beneath oak” revealed acorn plum gall. It’s the home of a wasp species that uses this as a nursery. The grub slowly eats the gall’s tissue and metamorphs into a pupa before changing into a small wasp that eats its way out through a hole. This particular gall grows at the base of the acorn cup. 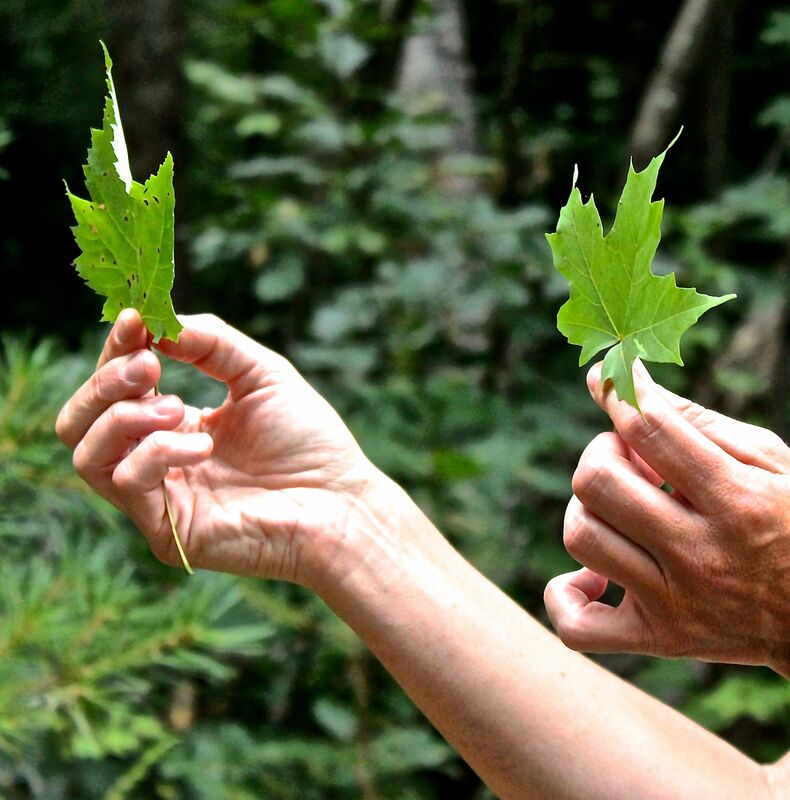 A red maple and a sugar maple stood side by side, making for a lesson on leaf id. Red on the left, sugar on the right. Red–more teeth, or as Kate said, R=rough. Sugar–a U between the lobes, and as Kate said, Sugar has a U in it. It’s their sap that the Abenakis knew. 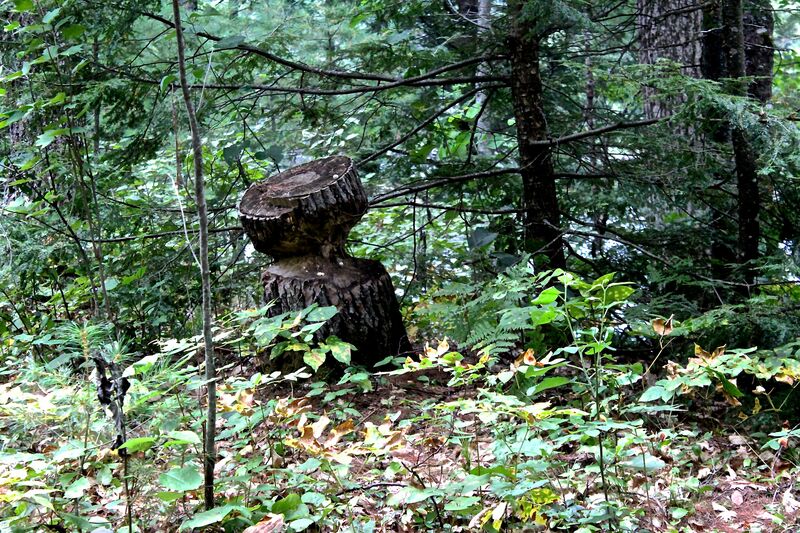 Though we didn’t see any fresh sign of beaver activity, we knew by this statue that they’ve been here in the past. I love that those who actually cut the rest of the tree down to prevent it from falling across the path, had the foresight to leave the beaver works for all to see. The beavers were important to the Abenakis for a variety of reasons, including as food, tools and warmth. 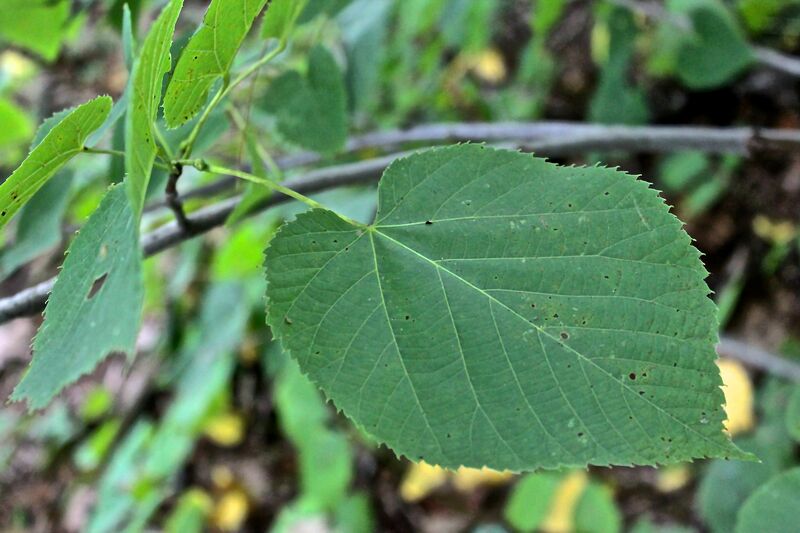 The asymmetrical base of the basswood tree makes it easy to identify. It was the bark, though, that was of prime importance all those centuries ago–the stringy fibers were used to make line or rope. 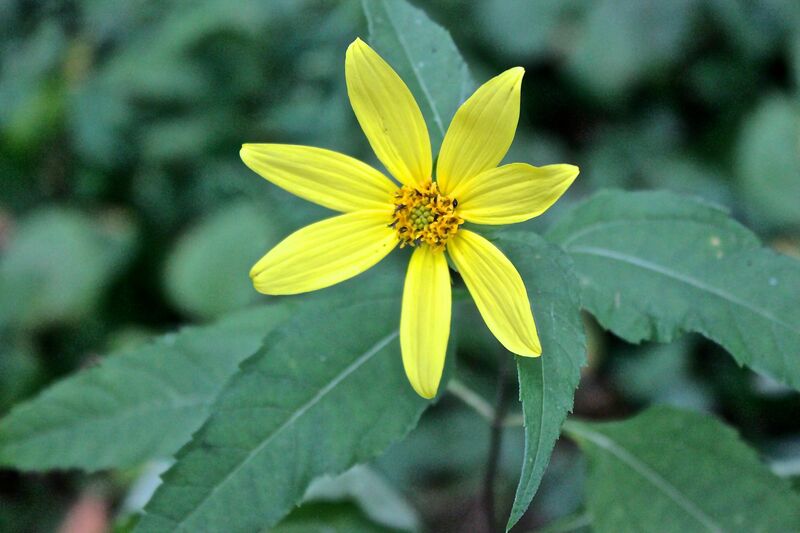 In bloom were the Jerusalem artichokes. 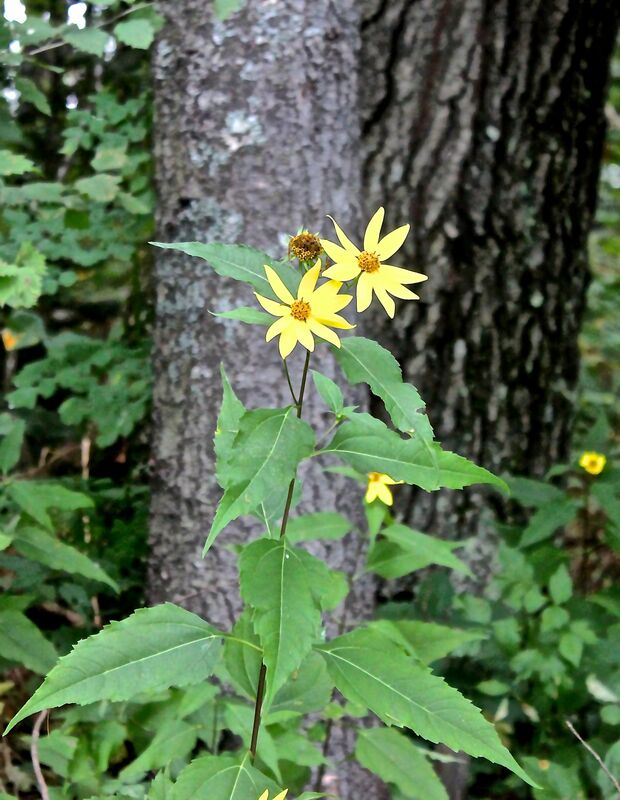 In Notes on a Lost Flute: A Field Guide to the Wabanaki, author Kerry Hardy writes, “Peeking out of the woods at Old Norridgewock are Jerusalem artichokes, the penak [ground nut]of the Abenakis who lived here. I believe these plants must be descendants of those grown here centuries ago.” How cool is that? The plants tubers are edible. On this day of reflection, remembrance and revelation, they shown brilliantly, perhaps a sign that reconciliation is possible. 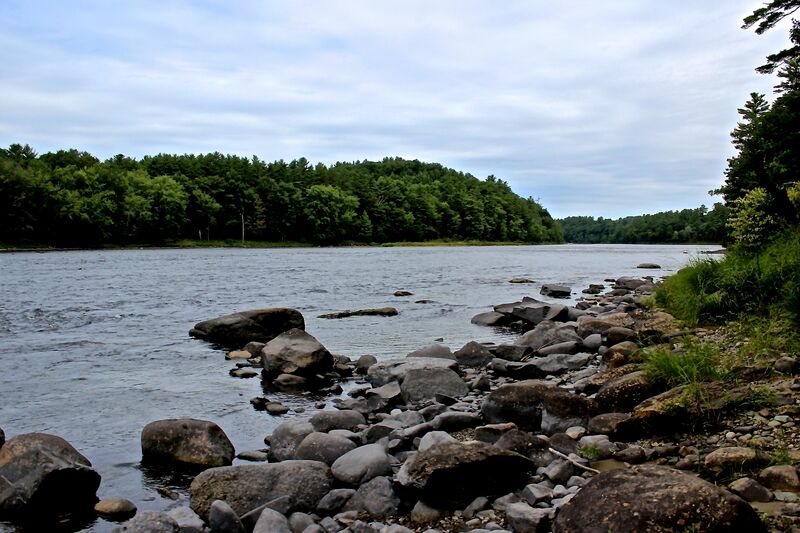 We spent some time beside the Kennebec where eels and alewives were important food sources. And an immature bald eagle let us know of his presence. 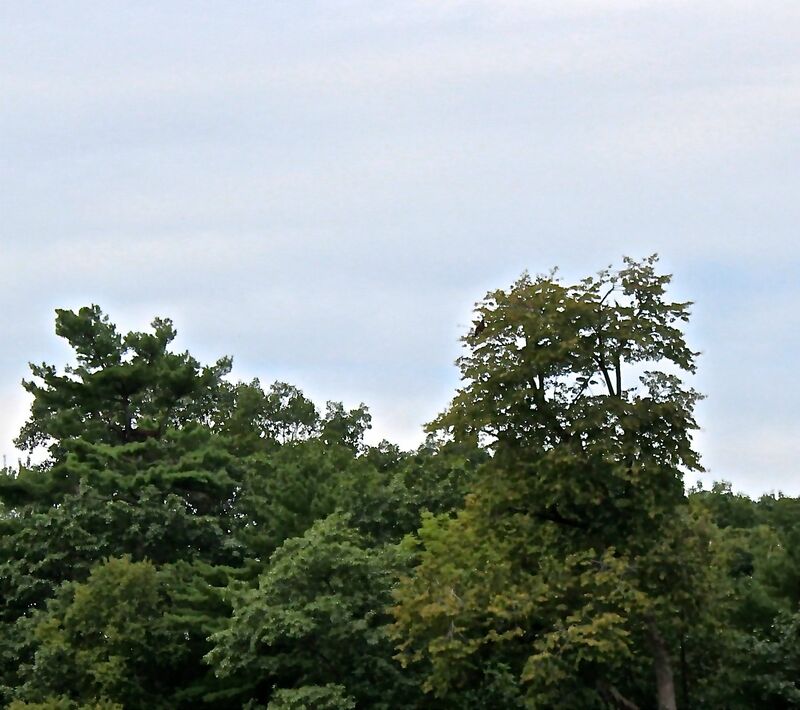 He’s in the oak on the right, while his nest is toward the top of the pine on the left. 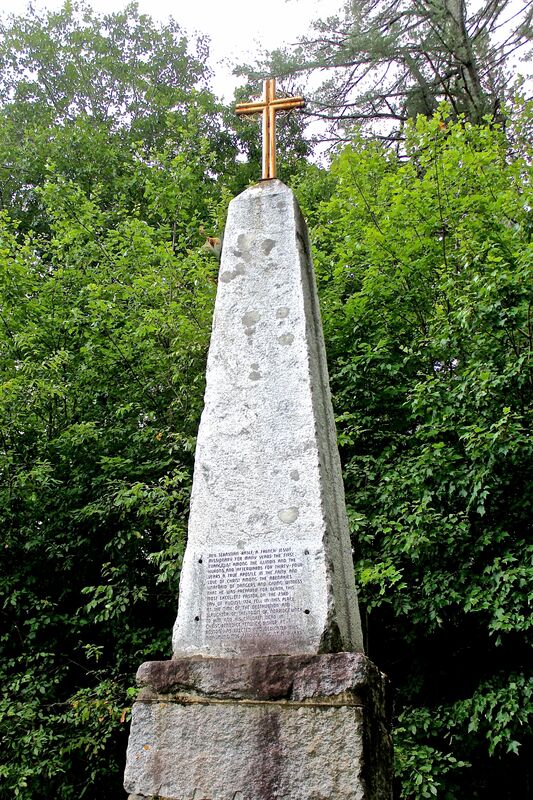 It is Kate’s hope that more people will want to learn about the history of this place. Kudos to her for embarking on renewing its spirit. 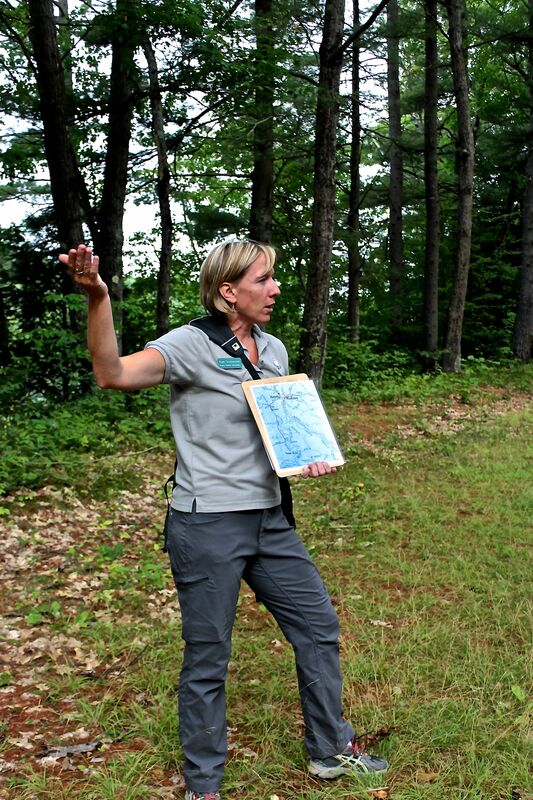 Thank you again Leigh, for sharing your eyes on the natural world of both the Abenaki and today. The land remains… I am immersing myself in a similar journey here in southeastern Vermont and it grows clearer and closer every day. Wlibaamkani (travel well)! Thanks Rick. Like you, I love discovering something new every day. And the more I learn about the Abenaki, the more depth I add to my knowledge base. Thanks for sharing the term for “travel well.” And the same to you.